Join us for a timely overview about how health care compliance programs are relevant for assisted living (AL) communities. While AL providers may not participate in Medicare or Medicaid, it is still important to understand fraud and abuse laws such as the Anti-kickback Statute, which can apply when referral and financial arrangements are in place with other Medicare providers such as hospitals, hospices, home health agencies or therapists. This seminar will give an overview of key issues that may arise for AL providers and issue spotting in order to consult legal counsel about proposed arrangements. The Department of Health and Human Services, Office of Inspector General (OIG) and the Department of Justice (DOJ) have published many resources for other health care settings that offer AL providers insight on how to think about prevention and detection of potentially problematic arrangements. Additionally, certain elements of a compliance program may help with meeting state licensure requirements, other state conflict of interest and fraud and abuse laws, and commercial payor/network arrangements. This free webinar is available to AHCA/NCAL and ABM members and will be held on ahcancalED. Login credentials required. The webinar will be recorded for on-demand access. Thousands of long term and post-acute care professionals have already reserved their spot in San Diego, October 7-10. Will you be joining them? If you haven’t registered the AHCA/NCAL 69th Annual Convention & Expo now is the time. Advance registration ends on September 21, and after this date on-site rates will apply. The AHCA/NCAL Convention & Expo is designed to help you succeed. With unique programming that will specifically address your toughest challenges, you will walk away with the strategies and solutions you need to SAVE money and improve the quality of care you provide. When you register, don’t forget your Gala Dinner & Show tickets. 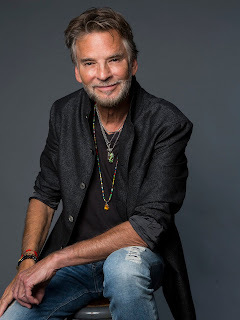 Kenny Loggins is headlining the Gala Dinner & Show, and it’s going to be a fantastic night of music, food, and fun that you’ll remember long after the San Diego night ends. The countdown is on, so clear your schedule, book your tickets and register for the Convention & Expo today! The online course provides education for healthcare professionals who seek to serve as Infection Preventionists and prepares individuals to meet the antibiotic stewardship requirements that took effect for nursing facilities on November 28, 2017. The training is also beneficial for assisted living centers because the methods for preventing and controlling infections are universal and apply regardless of setting. The course addresses both clinical and organizational systems, processes and cultural aspects of infection prevention and control that are fundamental to effectively leading and administering successful infection prevention and control programs and antibiotic stewardship programs. Strong and effective infection prevention programs and antibiotic stewardship efforts can set nursing facilities and assisted living centers apart from the competition, especially when working with social workers and discharge planners who help seniors with their post-acute decisions. While CMS has announced plans to offer a free infection prevention training course some time in Spring 2019, AHCA/NCAL recommends investing in staff training now rather than waiting until sometime next year to train staff on the requirements that already are in effect. That’s because nursing facilities continue to be surveyed on all the new infection prevention and control requirements and the antibiotic stewardship requirements – the same requirements leading to the most commonly cited F-Tag since November 2017 under Phase I and Phase II of the CMS Requirements of Participation and the implementation of the new nursing facility survey process. Take advantage of this great clinical career building opportunity. To access ahcancalED and the IPCO course, members will need to login with their AHCA/NCAL usernames and passwords. For assistance obtaining AHCA/NCAL usernames and passwords, please e-mail update@ahca.org with your name and facility contact information. Three out of Four LTC Facilities Are Being Over-Charged on Their Utility Bills! AHCA/NCAL Gero Nurse Prep is affordable at $690 for 30 nursing contact hours filled with high quality training that gets results. For RNs interested in pursuing Board certification through ANCC, that cost is an additional and separate cost of $395. The second webinar will occur on Wednesday, September 12, from 2:00 to 3:30 p.m.and focus on changes impacting proper coding of Section GG: Functional Abilities and Goals and Section I: Active Diagnoses. What's the Key to Having Committed, Satisfied Staff? The first 90 days for a new, assisted living employee are crucial. Employees develop attitudes about the organization, leadership, culture, and their job. These attitudes in turn affect organizational commitment, job satisfaction, performance and intent to stay (retention). NCAL Day at the AHCA/NCAL Convention & Expo covers this timely topic with the session, “From Theory to Practice: How to Improve Job Satisfaction and Retention with the 7/30/60 Day Engagement Model.” Join us Sunday, October 7 at the San Diego Convention Center for practical solutions to this critical issue. This session will offer take-away tools and techniques to operationalize the 7/30/60 Day Engagement Model, so you can respond more effectively to employee development during the onboarding and critical 90-day socialization period. David has worked in the field of Human Resource Management within the healthcare profession for over 25 years, and most recently has served as Vice President of Human Resources with Tealwood Senor Living, and is currently an HR Consultant with Tealwood. NCAL Day is a separate ticketed event and must be purchased in addition to any convention registration package. See what the rest of NCAL Day has to offer, as well as the entire week of the 69th Annual AHCA/NCAL Convention & Expo. Or go ahead and register for Convention now. According to an August 22, 2018, article from McKnight’s, “OneCare Vermont — a statewide ACO coordinating care for more than 112,000 beneficiaries — just launched a new pilot program with three local skilled nursing facilities. The three SNFs will now be able to accept Vermont Medicare patients after just one day in the hospital, according to the Sentinel. Typically, under Medicare rules, patients need to be at a hospital for at least three consecutive days before Medicare covers their treatment at a SNF. The OneCare Vermont ACO is granting two local hospitals and its SNF partners a waiver to drop the requirement to one day under a new pilot program. The change will affect some 5,000 patients.” The full McKnight’s article can be found here. AHCA/NCAL supports eliminating the three-day stay requirement and solving the related issue of observation stays. AHCA/NCAL also continues to advocate for the Improving Access to Medicare Coverage Act of 2017 (S. 568/H.R. 1421) that was introduced on March 8, 2017, by Congressmen Joe Courtney (D-CT) and Glenn “GT” Thompson (R-PA), and Senators Sherrod Brown (D-OH), Susan Collins (R-ME), Bill Nelson (D-FL) and Shelley Moore Capito (R-WV). This legislation ensures that time spent under “observation status” in a hospital counts toward satisfying the three-day inpatient hospital requirement for coverage of skilled nursing care services under Medicare. For more information about observation stays and the three-day stay requirement, please visit the AHCA/NCAL website. The Internal Revenue Service (IRS) published a proposed rule that, if left unchanged, leaves unclear the status for assisted living community owners to take full advantage of this year’s federal tax cuts. The new tax law allows passthrough entities like limited liability corporations, partnerships, S corporations, and sole proprietors to deduct 20% of their "qualified business income." Congress defined qualified business income as that which does not include a “specified service trade or business.” Health care services are considered a specified service trade or business, and therefore health care services cannot be considered qualified business income to take advantage of this deduction. The proposed rule stipulates that skilled nursing facilities (SNFs) cannot take advantage of some of the tax deductions in the 2017 tax law because of their status as "specified service trade or businesses.” Although the proposed rule does not address assisted living expressly, NCAL’s initial view is that many assisted living communities would avoid being characterized as a "specified service trade or business" either by virtue of the fact that they do not provide "services in the field of health" as defined by the IRS or they provide so relatively little that it triggers the de minimus rule. Ultimately, it would depend on an individual analysis of every assisted living community that would otherwise qualify for the deduction. AHCA/NCAL CEO and President Mark Parkinson said “[t]he rule is inconsistent with Congressional intent” and that [t]he intent of the law was to provide tax cuts to job creators and those willing to put capital into the economy.” AHCA/NCAL will “submit comments and will forcefully advocate our position” and “go to the Hill and seek legislative relief” if necessary, Parkinson continued. The rule is part of the regular notice of proposed rulemaking (NPRM) process, is not final, and will become law after stakeholders weigh-in and the IRS codifies it. Comments are due by October 1st. Read this Q&A document for more information about Compass plans for AHCA/NCAL members. Versions of the Compass 1 & 2 MEC plans are available in all 50 states. Changes to the Hospital Indemnity benefit vary based on state approvals. For more information about this innovative new employee health benefit, please contact Nick Cianci at 202-898-2841 or Dave Kyllo at 202-898-6312 or email ahcainsurancesolutions@ahca.org. The Advance Registration deadline is next month, so don’t delay. 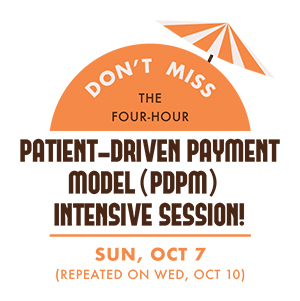 The Patient-Driven Payment Model (PDPM) is now final with implementation scheduled for October 2019. To help you prepare, AHCA/NCAL is offering a four-hour intensive session at convention in October. Replacing RUGs — CMS’ New SNF Payment System & How to Get Ready will address and answer all of your implementation questions. Register today and take advantage of the Advance Registration savings from now until September 21. The intensive will be held on Sunday, October 7 and repeated on Wednesday, October 10. In addition to in-depth training on the PDPM final rule, a members-only tool kit will be introduced that will contain the core competencies framework and a readiness review tool that will help you track your operational readiness for PDPM. The intensive will also cover data gathered from 12 companies testing impacts of PDPM and provide hospital and discharge pattern data that could be helpful in member markets. Finally, a panel discussion of AHCA members will discuss opportunities and potential pitfalls for SNFs as they consider operational changes necessary to be successful under PDPM. 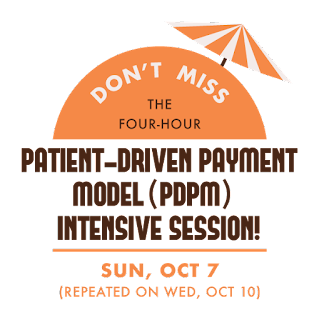 Attendance at the PDPM Intensive: The PDPM intensive sessions will be open to all convention attendees who have purchased a Sunday Only, Wednesday Only, Full or Premium meeting package possessing an Attendee, Sunday, or Wednesday badge. All other badge holders will not be given access. Access to PDPM proprietary tools will be provided via e-mail to SNF provider members only via e-mail at the conclusion of the convention. If you have additional questions, please raise them during the webinar. To register for the webinar, click here. This webinar is open to SNF and AL members. In the fall of 2017, Beneficiary and Family Centered Care Quality Improvement Organizations (BFCC-QIOs) launched Healthcare Navigation programs that offer a good solution for Medicare fee-for-service patients who need help navigating the health care system. BFCC-QIOs provide care management coordination that can help Medicare fee-for-service patients journey through the often challenging health care system. During that process, BFCC-QIOs coordinate patient care, connect patients and caregivers with resources, and provide patient support in understanding the healthcare system. "Yes and..." Two essential words in improv. Two life-changing words for a resident living with dementia. NCAL Day at the AHCA/NCAL Convention & Expo offers an interactive workshop, “IMPROV and Dementia: Learning to Say 'Yes and' When Interacting with Residents with Dementia​.” Join us Sunday, October 7 at the San Diego Convention Center for this fun, eye-opening experience. Improvisation, or improv, is a form of live theater in which the plot, characters, and dialogue of a game, scene, or story are made up in the moment. The lessons from improv can be applied to dementia care, as staff should get into the residents’ world rather than try to force the residents into theirs. This train-the-trainer program will give you vital tools to teach caregivers how to use improv theater skills in their interactions with residents with dementia. Learn how to use “yes and” as a positive way to respond to residents and how to be in the moment with them. 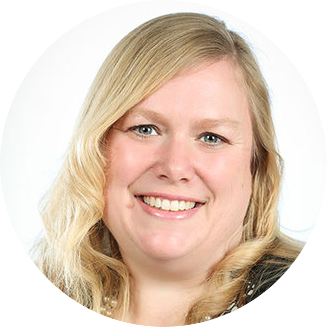 Laura has 23 years of experience in long term care, including as an assisted living provider and developing assisted living curriculum. She is an active member of the Purple Angel Dementia Friendly Communities for Green Bay, Wisconsin, which trains businesses on how to be dementia-friendly. Give your residents with dementia one of the greatest gifts - a sense of purpose and acceptance. Improv is the language staff can use to accomplish this. Learn more about what NCAL Day at Convention has to offer. Or register for Convention now. Today NCAL revealed a new member benefit for assisted living providers, the AL Cost Calculator. Powered by Prime Care Technologies, the AL Cost Calculator is web-based, enhanced resident assessment tool that allows assisted living providers to assess how costs are allocated across residents. The AL Cost Calculator allows an assisted living community to assess costs by completing an assessment with 25 possible health and service categories for each resident. Users then enter in wages for licensed and unlicensed staff, and then the AL Cost Calculator computes the average monthly costs for each resident and the overall monthly costs for the community. Other anticipated monthly costs, such as taxes and benefits, may also be factored in to total costs. Why use the AL Cost Calculator? ​Assisted living communities may already fill out resident assessment forms, but the AL Cost Calculator puts dollars behind that information. 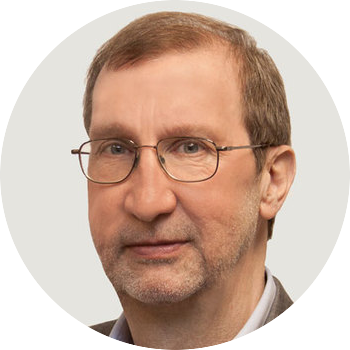 Better understand where your resources are going across your organization, over time. Drill down costs per resident, or compare costs organization-wide, per community. Compare between licensed and unlicensed staff as well as the type of care task. With acuity rising in assisted living, better monitor the evolving needs of your residents. If you’re a Medicaid provider, help educate state Medicaid programs about assisted living costs. Best of all, it’s an exclusive benefit as part of NCAL membership, meaning there’s no additional cost. Learn more, register for the tool, or see how-to videos on our website: www.ALCostCalculator.org. Payment and registration must be made online in ahcancalED . The IPCO course can be accessed here or at: https://educate.ahcancal.org/p/ipco. Congratulations to the California Association of Health Facilities! The California Association of Health Facilities has earned a 2018 ASAE Power of A Gold Award for its Nursing Home Leader Academy of Excellence, a professional development program to produce immediate improvements in the care and dignity of residents in a skilled nursing setting. ASAE honored the program which offers high-level leadership training, meaningful improvement action projects and shared success through lessons learned to advance each professional’s skills. According to ASAE, ASAE’s Power of A (association) Awards, the industry’s highest honor, recognize the association community’s valuable contributions on the local, national and global levels. The Power of A Awards reward the outstanding accomplishments of associations and industry professionals who work tirelessly to strengthen lives, the workforce, our systems and structures, the economy and the world. AHCA/NCAL is pleased to announce a new preferred provider partnership program called Cleary Energy. The program is designed to save AHCA/NCAL members significant money on their utility bills without adding new expenses to their budgets. Most long term care facilities (about 75%) are being overcharged for one or more of their utilities. Clear y Energy has recouped on average 4% to 8% savings on utilities for long term care facility customers. That’s a significant savings! Cleary Energy guarantees savings or its auditing services are free. Cleary Energy’s fees are based on facility savings on their utility bills. The American Health Care Association (AHCA) expressed disappointment last week concerning an Internal Revenue Service (IRS) proposed rule relating to the tax status of skilled nursing providers. The Trump administration’s signature tax law allows passthrough entities like limited liability corporations, partnerships, S corporations, and sole proprietors to deduct 20% of their "qualified business income” but only if they are not a specified service business. AHCA will “submit comments and will forcefully advocate our position” and “go to the Hill and seek legislative relief” if necessary, Parkinson continued. Last week, the American Health Care Association and National Center for Assisted Living (AHCA/NCAL) announced that two skilled nursing care centers and two assisted living communities have earned the 2018 Gold – Excellence in Quality Award. The award is the final of three distinct levels possible through the AHCA/NCAL National Quality Award Program, which recognizes organizations nationally that serve as models of excellence in providing high-quality care. Maine Veterans Home – Machias and Sunrise of Gurnee are the first free-standing assisted living communities to ever attain the Gold – Excellence in Quality Award in the history of the program. Since the inception of the National Quality Award Program in 1996, only 34 long term and post-acute care providers—excluding this year’s recipients—have achieved this level of quality recognition. AHCA/NCAL announced the recipients of the Bronze – Commitment to Quality on May 31 and Silver – Achievement in Quality on June 28. A full list of recipients is available on the AHCA/NCAL Quality Award website here. The program is sponsored by the following AHCA/NCAL Associate Business Members: First Quality, NRC Health, and Team TSI Corporation. The awards will be presented to recipients during AHCA/NCAL’s 69th Annual Convention & Expo in San Diego, California, October 7-10, 2018. The Patient-Driven Payment Model (PDPM) is now final with implementation scheduled for October 2019. Register for the AHCA/NCAL Convention and receive the answers to your implementation questions during a four-hour intensive session: Replacing RUGs - CMS' New SNF Payment System & How to Get Ready. Attendance at the PDPM Intensive: Due to proprietary information, attendance at the PDPM intensive sessions (Sunday at 1:00 pm and Wednesday at 10:30 am) is limited to SNF providers only. No other attendee types will be permitted inside the session rooms. If attending the Sunday intensive, you must pick up your convention badge at registration prior to attending the session. Advance registration continues through September 21, after this date on-site rates apply.